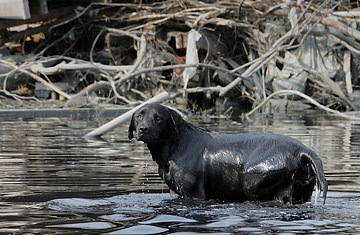 A dog stands in floodwaters outside a home destroyed by Hurricane Katrina, September 2005. Jerry Sneed has more than enough to worry about as the 2007 hurricane season kicks into high gear. There are buses that have to be lined up for people who don't have their own transportation out of New Orleans if an evacuation is ordered. Officials are still negotiating with Amtrak for trains to evacuate the disabled and those too sick to be crowded onto buses. And thousands of families are still living in FEMA trailers hardly built to withstand a strong wind, much less another Katrina. No wonder Sneed, director of the New Orleans Office of Emergency Preparedness, shoots you an exasperated look when asked about what the disaster plans are for animals  a look that says the pet issue has become something of a pet peeve. Don't get him wrong: Sneed likes animals as much as the next guy. But making provisions for the evacuation of pets, now mandated under state and federal law, adds one more layer of complexity to the already difficult task of getting people out of harm's way if a hurricane threatens Southeast Louisiana this year. The chances of that happening are higher than normal. The National Hurricane Center has forecast a busy Atlantic tropical storm season, with 13 to 17 named storms. Three to five of those could reach Category 3  Katrina was a Category 3 storm when it struck the Gulf Coast on August 29, 2005  or higher, and under the city's new policy a storm that size headed for New Orleans would trigger a mandatory evacuation order. Pets played a role in some of Katrina's countless horror stories, and city officials are wrestling with how to avoid a repeat. During that dark time, cats were left for what evacuating owners thought would be a two- or three-day exile that turned into weeks or months; dogs chained in backyards were left to drown; and pets were separated from their owners at shelters, some never to be reunited. But the concerns of animal rights advocates notwithstanding, the biggest issue to emergency authorities are the people who stayed in New Orleans for Katrina because they refused to leave their pets behind. "To a lot of people, these animals are their children," Sneed says. A survey conducted after Katrina found that 44% of those who chose to ride out the storm did it because they could not evacuate with their animals. Should another evacuation be called, he says, "we have to make it more practical for people to leave than to stay. If one of the reasons people stayed was because they had pets, then we have to be able to assure them this time that their pets will be okay." There's no way of knowing how many companion animals were left behind when Hurricane Katrina forced the evacuation of New Orleans. The Louisiana Society for the Prevention of Cruelty to Animals, which operates the city's animal shelter, estimates that 70,000 pets remained in the city during the storm; of those, about 15,000 were rescued. Only about 20% of the rescued animals were reunited with their owners, says LA/SPCA disaster preparedness coordinator Heather Rigney. "We were sending animals all over the country," she says. Many of the rescued animals had no identification tags; even in cases where owners could be identified, they often proved hard to track down. Concerned animal lovers across the nation adopted Katrina-orphaned cats and dogs; in a few, well-publicized instances, the original owners had to sue to get their pets back. Then there were the renegade animal rescue groups that poured into the city in Katrina's chaotic aftermath: hastily convened organizations that entered homes, often illegally, to search for animals, leaving buildings with gaping doors and broken windows, and vulnerable to people with less honorable motives. "Most people came here with good intentions," Rigney says. "But they didn't want to take direction from the city or the SPCA." This year's plan requires all rescue groups to register in advance with the animal protection agency. "You won't be seeing any fringe groups," Rigney promises. If the city's evacuation plan goes as scripted, such extraordinary rescue efforts may not be necessary. Authorities are hammering away at the need for people who have their own means to leave the city to make animals a part of their evacuation plan, whether it's scoping out in advance a hotel that allow pets or reserving space at a kennel outside the danger zone. For the city's part, Sneed says that, in compliance with the state and federal laws enacted after Katrina, people who do not have their own way out of town will be allowed to bring their pets with them when they report to one of the 13 pickup points scattered around New Orleans. The animals  provided they're in carriers  will be allowed on buses used to ferry evacuees to other designated sites outside the city; from there, the state takes over, using buses to move people to a network of shelters and what Sneed calls "climate controlled vehicles"  namely, tractor trailers  to haul their cats and dogs. Ideally, he says, owners and pets will be sheltered in close proximity; displaced people will have, if not the comforts of home, at least the comfort of a beloved pet. And shelter operators won't be saddled with the care and feeding of someone else's animal. Meanwhile, the LA/SPCA is gearing up for the possibility that it will have to use its own evacuation plan, in which shelter residents and staff would be relocated to Houston in the event of a Category 3 or greater storm. "For Katrina, we transferred 263 animals," Rigney says. "And they all made it safely."